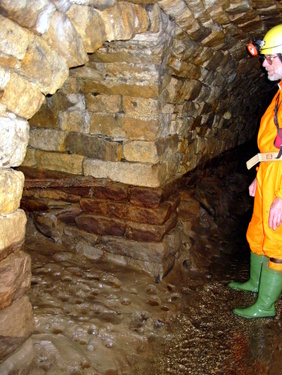 This photograph taken in 2006 by Peter Hodge, shows the stone-walled lining in the adit where it passes through unstable ground. The boundary between the dark stones and the lighter stones indicates the water level before the water behind the 1980s dam was drained. The reason for such a well constructed alcove is unknown. A length of rail can be seen jammed across the corner of the recess. Click the image to see a larger version.